Cooking bases: Je vous salue, ma Crêpe | Pasta & Co. There are at least 100 different ways to prepare crêpes. Thick or thin, sweet or salty, soft or crunchy, they’re always a pampering creation. Following this recipe, you will get about 15 of these French style pancakes. Three crêpes each for 2 people fit a 9x7in roasting pan. And you may use the others as dessert (Nutella or Dulce de Leche are the best fillings!) or the following morning for breakfast! If empty, they can stay in the fridge for a couple of days, tops. Melt the butter in a butter warmer and put aside. Beat the eggs in a large mixing bowl. You want plenty of room in the bowl to maneuver. Take a strainer, place it on the bowl and add 1-2 tbsp of flour, stirring with a whisk as you add. This way you’re sifting the flour and with the magic whisk you get rid of all the lumps. Work the flour well with the whisk and every time it thickens, stir in some butter, milk & water and again flour till everything is mixed well. You will get a nice smooth yellowy batter. Cover and let it rest for 30 minutes. Heat a lightly oiled skillet or frying pan over medium high heat. Stir the batter and scoop it onto the hot griddle. You will need approximately 1/4 cup for each crêpe (but this depends on how big your pan is). Tilt the pan with a quick circular motion so that the batter coats the surface evenly. If you like them thinner, while quickly tilting the pan, drain the excess liquid back to the bowl. Cook the crepe for 15-20 seconds until the bottom is lightly brown. Loosen with a spatula, and let it slip on a round platter. If you like them thicker, let it stay, loosen with a spatula, turn and cook the other side. Repeat for the rest of the batter and brush more oil on the skillet if it becomes sticky. 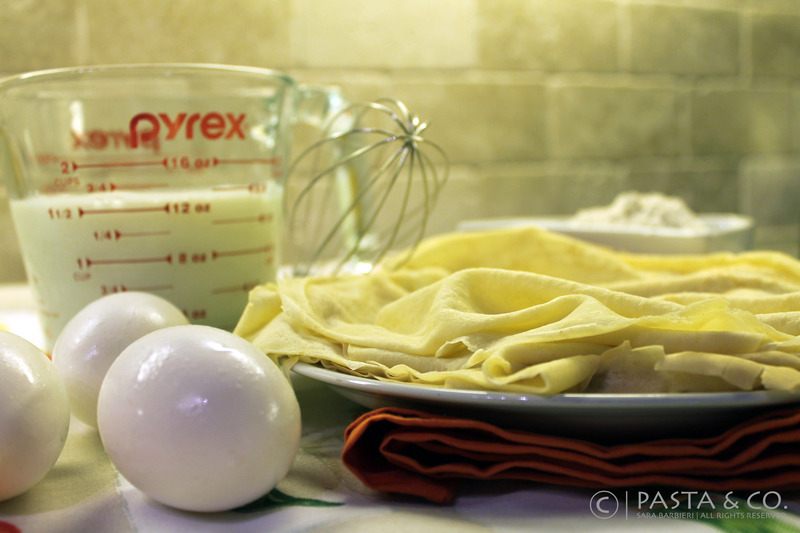 According to the recipe and to the thickness, crêpes can be folded and presented differently. Finger food snacks can be little bags with a chive ribbon filled with a thin layer of ham mousse and fresh cheese. Creamy fillings like a mushroom or asparagus mousse call to fold ends and sides over to completely cover the filling. Triangles are an option for thick fillings (roquefort and walnuts, or smoked salmon and philly). If you have slices, like ham & cheese crêpes, a roll is the most suitable folding. Bèchamel gratin, even if delicious, is not really easy on the eyes (and on the plate). An alternative would be warming the crêpes in the oven and serving them on a thin bed of bèchamel mixed with the filling. Creativity is the keyword here!